No matter the season, sandals are a serious style winner! Shop our slayin' selection of women's sandals, and finish off your fabulous look the right way. Keep it classic with a strappy sandal heel, or be dare to be different with sassy suede fabrics and mega metallic styles. 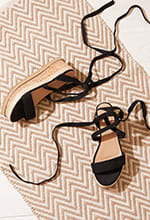 Team your summer swimwear or dainty day dress with effortlessly cool espadrilles, and you'll be a style queen fo' sure! Pair your smokin' sandals with delish denim and a cute clutch for the perf dressy-casual vibe. We've got casual flats or extra AF tie-leg styles for you to add to bag, babe! Whatever your vibe - be sure to put your best foot forward, hun!